Tangy BBQ sauce gives this mac and cheese its sweet Memphis style. The fact that it's done in 30 minutes makes it a dish to keep in your repertoire. Cook Macaroni as directed on package. Meanwhile, brown meat with onions and garlic in large skillet; drain. 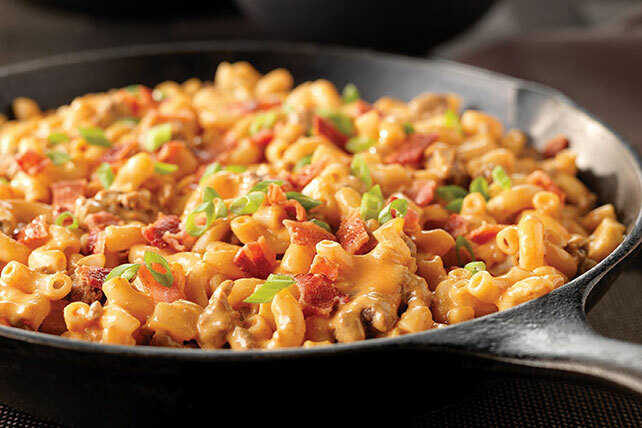 Add macaroni, Cheese Sauce and barbecue sauce to meat mixture in skillet; stir. Cook 2 to 3 min. or until heated through, stirring occasionally. Top with bacon and onions. Serve with a cold glass of prepared KOOL-AID Fruit Punch Soft Drink.